We are frequently told that modernising countries can leapfrog over others and go straight to a low-carbon economy. However this seemingly pain-free route ignores some of modernisation’s fundamental physical necessities. Modernisation is a multi-facted affair, but the historical lesson is clear. Socieities become overwhelming urban, erecting large scale infrastructure: hospitals, schools, roads, bridges, houses. And these modern infrastructures can be reduced to their base physical elements: steel, cement, aluminiumium, plastic, wood and glass. However the prospects of erecting this infrastructure any time soon without significant carbon emissions is low, as the case of cement in China demonstrates. The rapid development of China can be illustrated in myriad ways. The transition of Shenzen from a “fishing village” into an industrial mega-city in a few decades. The construction of more coal power plant capacity in one year than the total electricity capacity of Germany, Britain, or France. The list goes on. 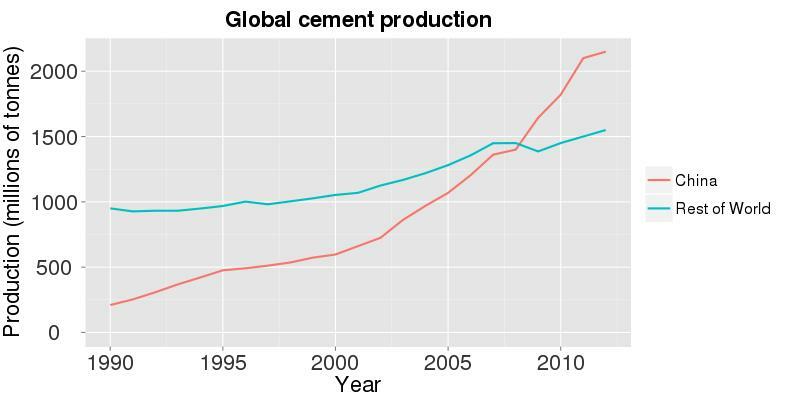 But as a recent book points out, this rapid development is perhaps best demonstrated by something we rarely think about: the scale of cement production in China. Consider this: in the last three years China produced more cement than the United States of America produced in the last one hundred years. Cement is used principally to produce concrete and mortar. And almost all infrastrucuture from wind turbines to skyscrapers are unthinkable without them. Despite the belief of many that silicon is the most important material on the planet our civilization is far more heavily dependent on such old fashioned things as steel and concrete. So, if you wish to erect a modern civilization you will need to lay down a rather large amount of concrete, often reinforced with that other old fashioned material steel. And China is now erecting infrastructure at an historically unprecedented scale. This is illustrated well by its rapid urbanisation and astonishing rate of power plant construction. In 1990 China’s urban population was just over 300 million. By 2010 it had doubled to just over 630 million. This growth in urban population, over 300 million in only two decades, is in fact greater than the total urban population of the United States and Canada put together. 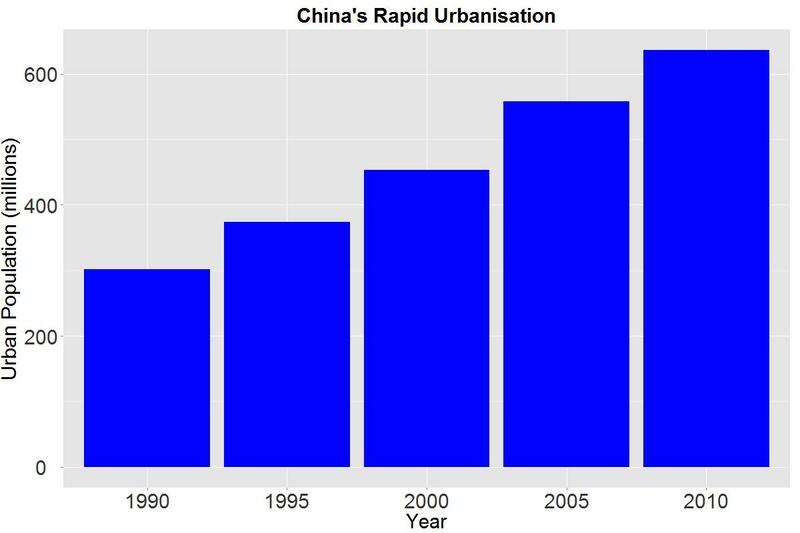 China’s rapid urbanisation has inevitably lead to residential space being built at an incredible rate. China’s urban population is now increasing by the size of London every six months or so. And due to building practices in China this has led to huge boom in cement consumption. It now seems inevitable that we will see “China’s urban billion” within the next couple of decades. The challenges facing human civilization essentially come down to making cities work. As of 2008 the majority of humanity live in cities, and by the middle of the century it will be closer to 80%. David Simon, one of America’s great social critics, recently remarked “We either figure out the city, or we die”. China’s rapid urbanisation, and the challenges and potential that result from it, demonstrate the fundamental truth of this statement. And a fundamental challenge is limiting the impacts of the material requirements of this rapid urbanisation. By some measures almost half of China’s infrastructure was built since the year 2000. This is probably the case in terms of residental space. It is certainly the case when it comes to energy infrastructure. 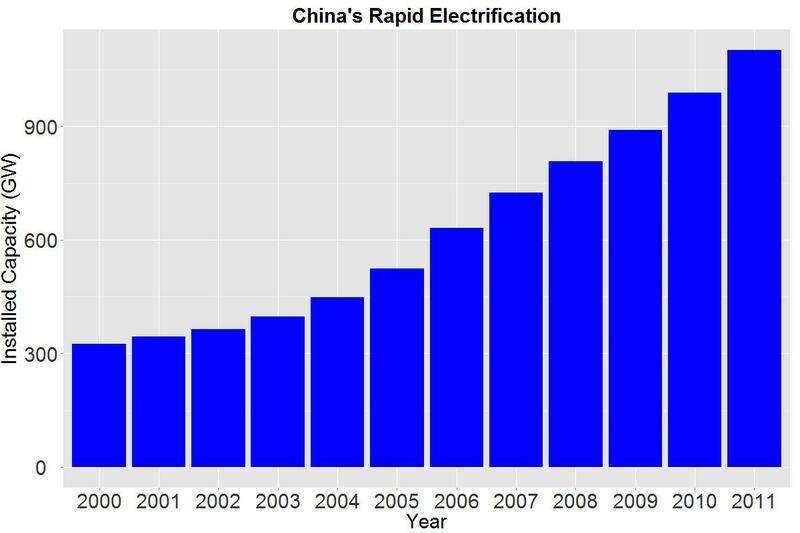 In the space of a single decade, from 2000 to 2010, China’s total electricity capacity tripled. China’s massive hydro-electric dams are particularly big consumers of cement. The Three Gorges Dam required almost eleven million tonnes of cement during its construction. This is more cement than the United Kingdom now produces in a single year. China now produces over 2.2 billion tonnes of cement each year, almost 60% of the global total. Unlike other commodities the cement China produces is almost entirely consumed in China itself. Exports only amount to 0.8% of production. Since 2000 China’s annual cement consumption grew by 1.5 billion tonnes, while the rest of the world’s only grew by 500 million. That three quarters of the growth in global cement production in the last decade came from China is close to being literally unbelievable. We cannot rule out a certain amount of exaggeration in China’s (notoriously unreliable) official statistics. However even within reasonable confidence boundaries we can be confident that the vast majority of new cement production and consumption is within China. These trends perhaps could be explained largely by China’s large population, but per capita consumption rates in China are equally impressive. In 2011 China produced approximately 1.6 tonnes of cement per person. This is four times higher than the historic peak in the United States, and higher than all but five other countries. A revealing historical comparison is with South Korea, which experienced a similar rapid economic rise, often called “The Miracle on the Han River.” China’s per capita cement consumption now far exceeds that of South Korea’s at its peak. South Korea peaked at 1.3 tonnes per capita, while China looks set to potentially move past 2 tonnes per capita. 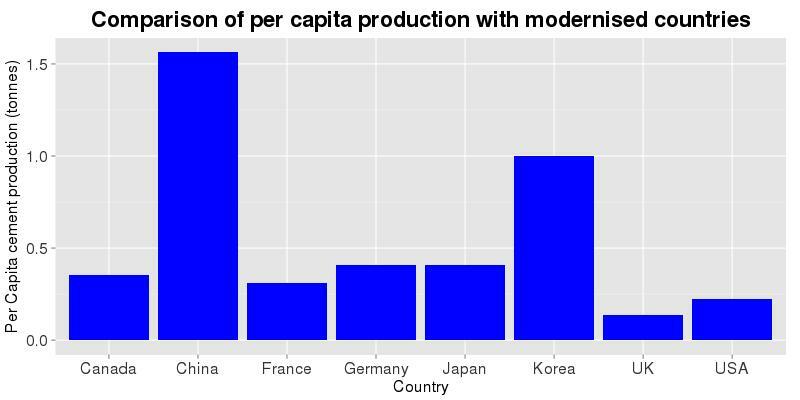 China’s per capita cement production is now at least four times greater than almost every modernised country, and more than ten times higher than in the United Kingdom. These chemical processes result in approximately 50% of the carbon dioxide emissions from cement production. The remainder comes from the energy input required in the production process, and for transportation etc. How much carbon dioxide does China’s cement industry produce? A recent paper by Ke et al. from the Berkeley Lab estimated that China’s cement sector emits 1.2 billion metric tonnes of carbon dioxide each year (using 2010 figures), and potentially more. This is approximately 14% of China’s carbon dioxide emissions. Even more astonishing is that this is more than the total annual emissions of Germany and Japan. 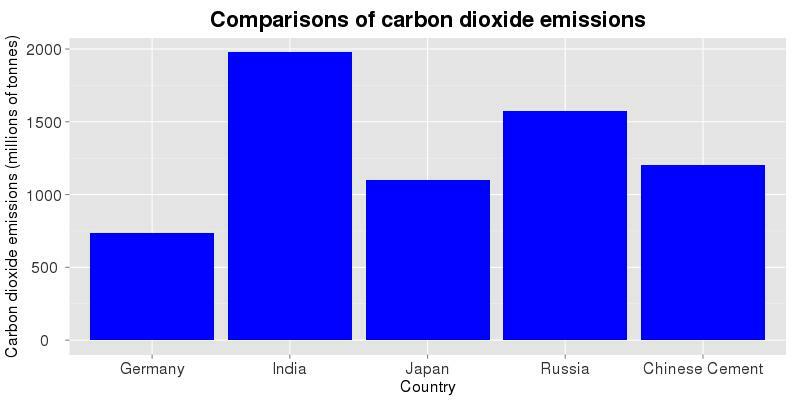 In fact the only individual countries with annual carbon dioxide emissions greater than China’s cement industry is China itself, the United States, India and Russia. As discussed by Allwood and Cullen in their recent book the prospects of replacing current production methods of cement with low carbon alternatives are low. However in comparison with other countries China’s cement industry is relatively inefficient. Theoretically the minimum energy requirement of production of cement is 1.8 GJ/tonne, and global best practise is now as low as 2.9 GJ/tonne. However China currently produces cement with an average energy intensity of around 5 GJ/tonne, compared with below 4 GJ/tonne in the European Union. Energy efficiency improvements can therefore lead to significant reductions in emissions from cement making, but with a physical upper limit on what can be achieved. Carbon capture and storage could potentially be used to sequester some of these emissions, but the prospects of China, or anywhere else for that matter, putting this in place any time soon are very low. Our ability to predict long term trends in cement production and consumption is plagued by multiple problems. Consider per capita cement consumption in the United States. Until the mid 2000s the long term trend had been largely flat since the 1970s, with per capita consumption fluctuating around 0.35 tonnes. A brief upward trend during the 1990s, coinciding with a delusional housing boom, saw per capita consumption reach an all time peak of 0.43 tonnes. 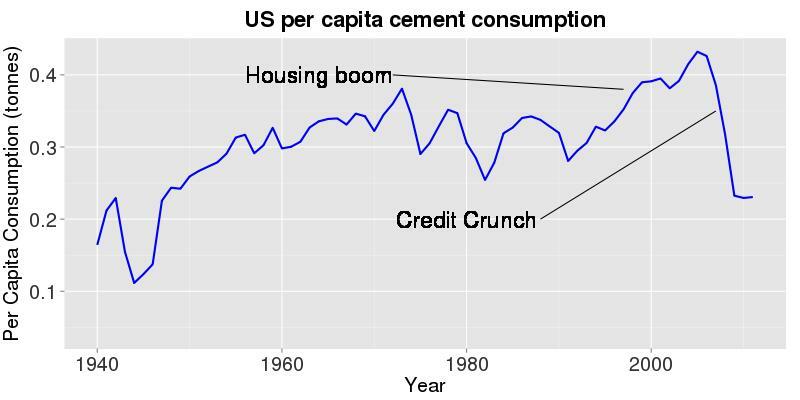 The credit crunch however resulted in a rapid collapse in US cement consumption, practically halving it over night, and returning it to its lowest levels in about sixty years. The medium-term sustainability of China’s high per-capita rates of cement consumption have been questioned by a number of analysts, while others point out that historically countries with per capita consumption rates above 1 tonne soon see a rapid decline in the construction industry and therefore cement consumption. How long China can maintain these rates of cement consumption remains uncertain. However in the long run China will transition to a society that largely maintains infrastructure, instead of building it. Its population is expected to start declining in approximately 15 years, and it will also see a continually ageing population. 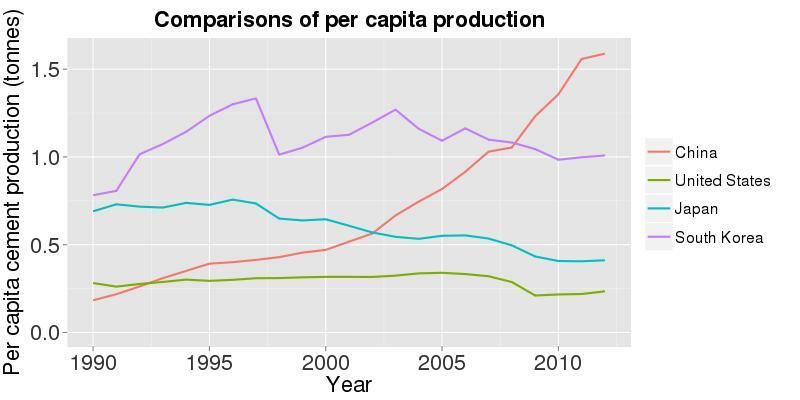 Therefore total and per capita cement consumption is almost certain to peak and then decline to levels seen in modernised countries, typically below 0.5 tonnes per capita. The size and timing of this peak are deeply uncertain, and reliant on how rapidly China develops and the shape of that development. However we can probably assume that barring an economic slowdown this peak will not occur until at least the 2030s. Questions also remain about the quality of cement produced in China, and how material intensive China’s future urban development will be. As always we have to accept uncertainty, not ignore it. Earlier in this article I compared the carbon dioxide emissions from China’s cement industry with the total emissions of other countries. Here is another comparison. Globally carbon dioxide emissions from aviation were almost two times less than those from China’s cement industry. Have you ever read an opinion piece about carbon dioxide emissions from cement? Quantitatively it is much more important than aviation, yet the column inches tell us this has little impact on our perceptions. So, amid all of the ceaseleslly ideological debate over whether we should decarbonise electricity with wind, nuclear or solar, or not at all, please take some time to think of those old fashioned materials such as cement and steel. Modern civilization cannot function without them, and the prospects of producing them on the desired scale without large amounts of fossil fuels any time soon is low. This requires us to reconsider how we use them, not simply how we produce them. To use the language of a fine recent book on materials production, we need to keep both eyes open.